If you watch the first video on the new Airbus electric light airplane you might have caught a reference to something called a Cri-Cri. Or maybe not, as it was brief “blink-and-you’ll-miss-it” mention in the history of French light aircraft development. So what is a Cri-Cri anyway? Unlike the new Airbus E-Fan or their A350 it doesn’t push any boundaries in technology or materials but it does push a size boundary, just in the opposite direction people are used to expecting. The Cri-Cri (as in chirp-chirp, as in a cricket) was designed in the 70s by Michel Colomban who designed a few homebuilt tiny aircraft including the MC-100 Ban-Bi (yeah I guess he had a thing for cutsey names). The Cri-Cri isn’t particularly notable other than, well, how freakin’ weird it looks and how positively tiny it is - everything about the aircraft is designed to be as small as possible. In its most powerful MC-15 guise it’s powered by two engines putting out all of 15 horsepower each mounted on nose pylons that look more appropriate for mounting GoPros on. It is simultaneously the world’s smallest twin-engine manned aircraft and the smallest twin-jet manned aircraft when someone got the bright idea to stick R/C aircraft jets onto it, and is just slightly heavier than the Bede BD-5J which holds the absolute record for world’s smallest manned jet (and is probably a hell of a lot more stable in flight to boot). I once owned a BD-5b....and made the best choice. As you can imagine it’s too small and underpowered to be useful as anything but a personal aerial hoon-toy - and that’s the point. It carries exactly one person, who is hilariously cramped up in that big plastic bubble like an old Peel Trident but even worse. Believe it or not it’s supposedly acrobatically-rated too. My knees aren&apos;t under the dash. Blake from Autoweek and I are getting uncomfortably close. So what does this have to do with a brand-new electric Airbus then? In 2010 EADS (which is the parent company of Airbus, except nobody knows exactly how to pronounce EADS so they just made everything easy by renaming themselves The Airbus Group) equipped a highly modified Cri-Cri with four electric motors (two per propeller) as a proof-of-concept demonstrator for what eventually became the E-Fan. 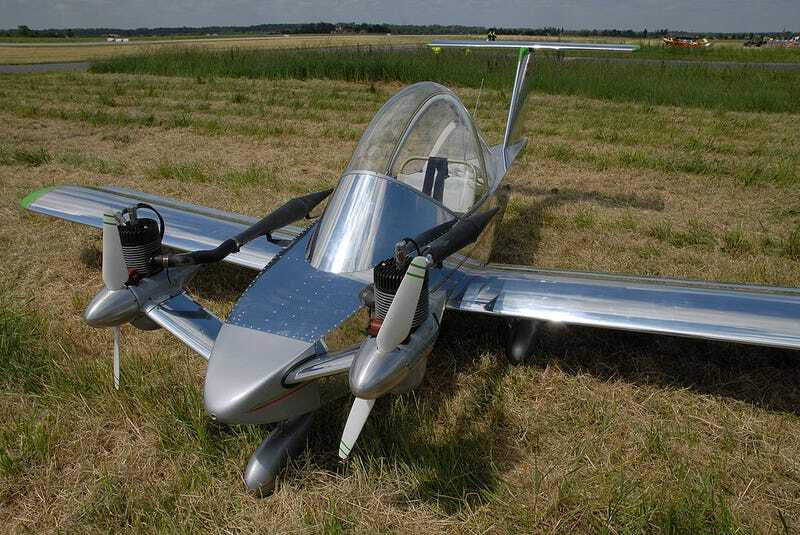 In the process they also created what is claimed to be one of the world’s smallest four-engine aircraft, although considering how easily electric motors can be linked to power a single output source and many light aircraft concepts envision even greater numbers of motors powering many propellers, it’s kind of like Toyota making claims that their cars are the most grounded to the ground. Just a few months later a company called Electravia went even further with a cleaned-up electric Cri-Cri named “Christaline” (which as you might’ve gathered is the aircraft pictured above) and broke the speed record for an aircraft powered by lithium-polymer batteries (which is pretty neat stuff) at 162 MPH. So there you have it, a weird little (and I do mean little) aircraft that proves that you don’t have to be big to achieve big things.